The teacher, using an instructional guide, told students they would adopt roles as Muslims for three weeks to help them learn what Muslims believe. She encouraged them to use Muslim names, recited prayers in class, had them memorize and recite a passage from the Quran and made them give up something for a day, such as television or candy, to simulate fasting during the month of Ramadan. 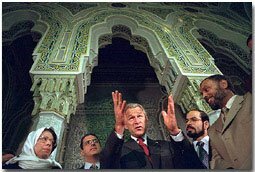 Natürlich ist das Blödsinn, aber Bush ist ja mit dem Saudischen Königshaus befreundet, dass für die härteste Christenverfolgung in der Arabischen Welt verantwortlich ist, und regelmäßig gegen Juden hetzt.